With most of these sidings painting is not generally considered an option. It can be done, but much of the cost justification of buying siding it is to avoid the painting costs. The house siding colors you buy are what you are supposed to be stuck with for the life of the product, which in most cases will exceed your own lifespan. The advantage of natural wood is that every few years you get to reinvent your house. The disadvantage is that every few years you have to reinvent your house. And all those sculpted curlicues, the scalloped tiles, and the Victorian spindles that you fell in love with when you bought the house have to be painted by hand. In my case I am stuck with a siding option that I am not happy with because I cannot justify nor afford replacing it with something I like better. The siding has covered the house since the 1960’s, and, unless I take action, could still cover it in the 2060’s. Down the road, in a small town, one of the older homes recently changed their house siding colors like a giant mood ring. It went from a bold, daring puce that I particularly disliked to a dark grey-green, solemn and foreboding, that I particularly dislike. I despise the owner’s palette while envying his freedom. If you have the budget to afford the frequent repaints, I cannot argue against a paintable surface. (NOTE: This has change! I've Painted My Aluminum Siding). Wood, especially old wood, will not hold paint long. I usually think of eight years as the lifespan of a paint job, but in some cases it is less. That will vary based on the wood you are using and its age. I know painters will claim that a high quality paint job will last 10 to 15 years, but that is under ideal conditions. I have some wood outbuildings that are probably 70 years old. They have always been painted but wood has become dried out. I have to touch up my paint every couple of years, with a full paint job at least every five. If wood is your preferred choice consider cedar siding. It takes paint better than most wood, and it holds it longer. The extra cost will be offset in the long-term by fewer paint jobs. And after all, you may like changing your house siding colors, but wouldn't you prefer to do it less often? One option for a paintable surface is fiber-cement siding (Hardiplank). Some brands come already painted with a baked on finish that is supposed to last 15 years, but when it comes time to repaint expect about a ten-year life span. Composite wood siding (hardboard) is another surface that can be painted. Like fiber cement it holds paint better than wood. However, I have my own painful story about composite wood siding gone wrong. I had the pleasure of changing my house siding colors twice. Once when I repainted and once when I replaced the siding. I suggest you read my story before committing to this option. Bricks can also be painted, though I wouldn’t recommend applying bricks just to paint them. Where they are painted, the paint does seem to last. My friend Mark Holt, the smartest painting contractor I know, insists that painting bricks can make them last longer as well as allowing you the option to change your house siding colors. While I think of brick as a very durable surface it is true that some bricks were made poorly and do start to crumble. I do not think this a problem with modern bricks, but back in the day, when bricks were made locally, the local clay may not have been the best, so in some areas crumbly bricks might be a problem. The other area where paint might help is with the mortar. Again, it is more of a problem with mortar from a bygone era, but if you have a problem, paint might help to stabilize the mortar, protecting it from ultraviolet radiation, pollution or acid rain. Most bricks I see painted today are painted to look like – bricks. Actually, in such cases they are often stained. The paint or stain just helps to create a uniform color over areas where repairs and additions may create odd mismatches. Back in my old neighborhood this was not the case. The brick was painted because the owner tired of red and wanted blue. It is an unnerving thought if you have never seen it, but it looked quite nice. Be sure to use an appropriate brick paint or brick stain. Adobe can also be painted. Your paint and stain options are basically the same as for bricks, but with stucco we tend to choose totally different colors than we would choose for brick. Stucco is extremely popular in the southwest. It mimics adobe, and it seems natural, especially when covered in earth tones. You could also just go primitive and cover your house in mud every year. Stucco is the longer term option. It blends well with the desert landscape, which is perhaps why you don’t see it as often outside of the Southwest. That is it blends well when you use those earth tones. Travel to Mexico and the same houses are painted in bright pinks and turquoise blue. They no longer blend, but they surely stand out. And they are beautiful. 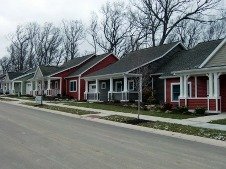 In many communities in the United States covenant restrictions would prevent you from painting with mariachi zest, but I see a lot of subdivisions where the three shades of grey and the two shades of taupe that are allowed could use a little a little color pop to awaken their residents to the possibilities of life. Concrete can also be painted, but since it is usually smooth-faced on a house exterior its not going to hold paint as long brick or stucco. A stain will probably will work, but won’t cover up anything like graffiti. Concrete can also be tinted when it is originally mixed, and this should be nearly permanent. Some siding options are supposed to keep their colors forever. If you find the color fading, or if you are simply ready for a change, you do have some options. Surprisingly, aluminum siding can be repainted. As I explained I don’t like the color of my aluminum sided house, so I do have the option of changing the house siding colors. But I also detest the wide plank style that was applied, and I need to fix some serous insulation problems with the house, so why paint when I need to re-side? But for those who like their siding try painting. Aluminum siding will hold the paint about 8 to 12 years, if properly applied. It needs to be cleaned good, as it tends to form a light oxide coating that will prevent good adhesion. It should be sprayed, or use a painting pad for a smooth finish. If there has been any hail damage or other ding use a flat paint to hide the imperfections. Some claim that vinyl siding can be repainted as long as it is painted a lighter color than the original tint. The theory here is that a darker color will absorb too much heat causing the vinyl to warp. I discuss this in my article on problems with painting vinyl siding. Others say that painted vinyl will peel too quickly. Vinyl siding expand and contracts more than any other siding. I would not attempt to paint it unless you are willing to bear the cost of having to repaint should it start peeling right away. Of course that will also give you another chance to change your house siding colors. Others disagree, and I have a guest expert, Lawrence Angell, who will explain his tips and techniques in an article on How to Paint Vinyl Siding. I suspect that the paint on vinyl siding will last longer in temperate areas that don’t get too hot or too cold, as this would minimize the amount of expansion and contraction. If feasible you might try painting a less noticeable section first and give it a year. Fiberglass siding is another story. It does not expand significantly so paint should stick around. Of course its original color is supposed to last close to forever, but if you really want to change your house siding colors, this should accept the right kind of paint.